For me a roast chicken, along with the stock made from the picked-bare bones, is one of the best things to come out of the kitchen. I simply adore it. No other food says home to me quite like this does. When the house is filled with the smell of a chicken roasting in the oven you know this is the place to be. It’s pure joy to me each and every time Rob or I bring home a fresh, free-range chicken from the butchers. It sits in my fridge full of possibility and with the promise of a simple yet fabulous meal. Without a doubt if I were asked to choose a last-request meal, this would be it. 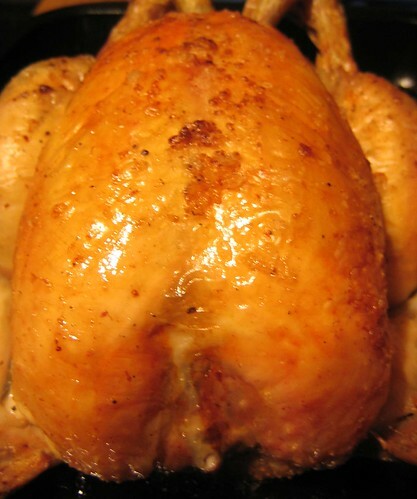 There are endless recipes for roast chicken out there and in my quest for the perfect roast chicken I’ve tried a lot. Stuff it, oil it, season it, turn it upside down for juicier breast meat. Chicken is usually the first thing I look up in the index of a new cookery book and it’s the foodie subject closest to my heart. Through all this I’ve come to find a method which I like and which gives me my perfect roast chicken. I guess it’s truer to say I’ve found a method with several variations as I don’t always stick to the exact same way each time – I’ll vary the herbs, how I use the butter, the vegetables I use. But I generally stick to some same principles each time which guarantee me the results I want. For me, lemon and garlic is optimum. Sometimes I’ll use one or the other rather than both for a change but it’s rare that I don’t use at least one. I put a halved or quartered lemon into the cavity, usually along with a whole bulb of garlic broken into cloves. It doesn’t always fit so I just put in what I can and sometimes I’ll squeeze some of the lemon that doesn’t fit over the breast. Sometimes I’ll put fresh thyme and rosemary in too, sometimes just one of these herbs. I’ve also used bay leaves in the cavity before. 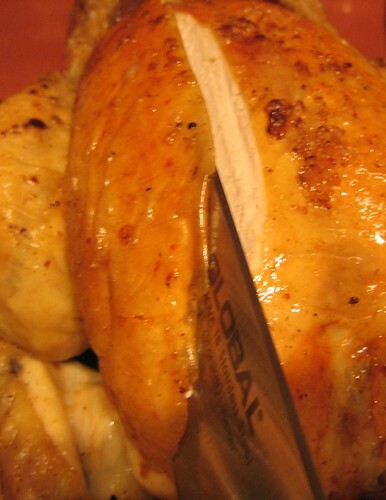 When I’m cooking a roast chicken I’m not interested in counting the calories and butter is another essential for me. The best way to use this is to separate the skin from the breast using your hands and push the butter up underneath the skin. When it’s in the oven the butter melts down into the breast leaving it deliciously juicy and buttery. I have omitted the butter before and used olive oil and whilst this is good it’s no match for the butter. Finally I rub olive oil over the skin and sprinkle sea salt and black pepper over the breast and legs. 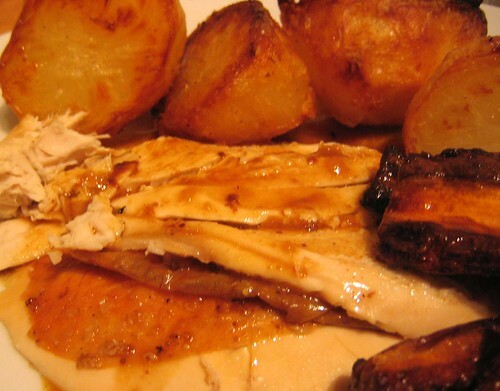 For the full roast chicken dinner you have to have really good roast potatoes. If I am going for the full roast I’ll almost always roast carrots in with the chicken – they are absolutely delicious roasted, becoming sweeter and sticky. I cook them in the same roasting tray as the chicken so that they take on all the flavour in those glorious, bubbling chicken juices and fat. I just halve them lengthways then cut them in half or into thirds, depending on their size. 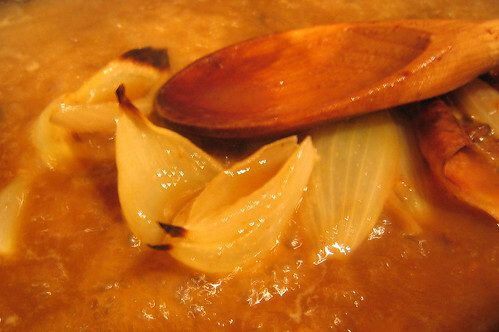 I tuck a quartered onion under the chicken, not to serve but to use as a base flavouring for the gravy. It roasts in the pan giving the gravy a gorgeous taste. I put the chicken in the oven at about 220c for 20 minutes, then add the vegetables to the roasting tin, basting them with the fat that has been released from the chicken. Now I reduce the temperature to 190c and roast for about an hour more, until the chicken juices run clear, basting the chicken and turning the vegetables halfway through the cooking time. The way to tell if it’s cooked is to put a skewer into a thick part of the chicken then press with a fork so the juices run out. If they are clear it is cooked. You get a lot of juices where the leg meets the breast so if you haven’t got a skewer just push a knife in there and take a look. Another way of telling is to pull on the leg – there should be a bit of easy give – and the skin should be golden, but the clear juices are the definite way of telling. 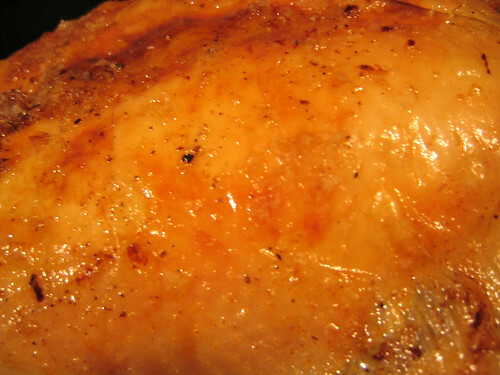 As with all meat, chicken needs time to rest so that the juices stay inside to keep it moist. Cover it with tin foil to keep it warm and rest for about 10 minutes. I don’t go to all this trouble just to smother my chicken in synthetic granules. Oh no, my roast chicken deserves the very best homemade gravy. I remove the chicken and vegetables from the tray, except for the onion, then remove most of the fat (leaving a little in) and then put the tray on the hob to start the magic – make sure you use a flame proof tray! Sometimes I’ll take some of the garlic from the cavity and put it in the roasting tray to give the gravy a lovely garlic hit. I just stir the cloves around with the juices, flour and water and take them out at the end. How anyone can groan at leftovers I’ll never know. I love having a cold roast chicken in my fridge to pick at and a fat roast chicken sandwich made with thick crusty bread and mayonnaise is divine. Then there are the other possibilities – chicken risotto, salad, pasta bake. All this out of one bird! The leftovers extend to the carcass. One thing you will hardly ever see me do is throw it away. That would be criminal and a huge foodie sin! Do you know how good home made chicken stock is? Have you tasted golden chicken broth? It’s liquid heaven. I found your blog through Google and I love your recipes. 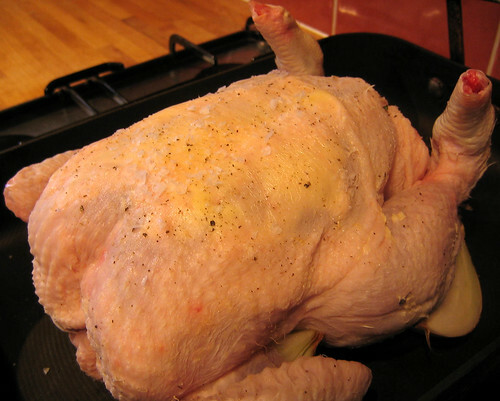 We’re cooking a roast chicken dinner for some friends today so we’ll definitely be trying your ideas. Especially the roast potatoes, we’ve been trying for ages to get them right! 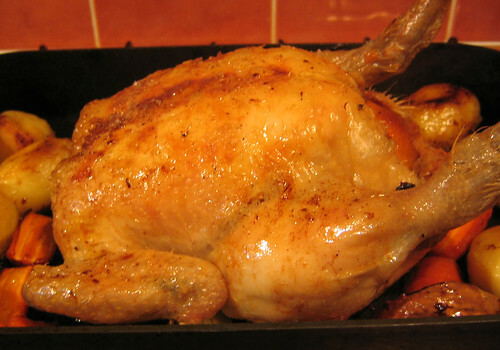 There's nothing like a roast chicken. So comforting, tasty and endlessly versatile. This evening I just roasted it by stuffing a lemon in the cavity, and olive oil, salt and pepper on the skin. It has been too warm for a full roast today so I did it with a salad of parma ham, olives, mixed tomatoes (fresh and sun dried) and anchovies. Hi everyone, thanks for all your comments.